When hosting a 10-year-old girl's birthday party, keep in mind she is probably out of the doll stage but not ready for teenage things. From invitations to decorations, plan the party with your child's taste in mind. 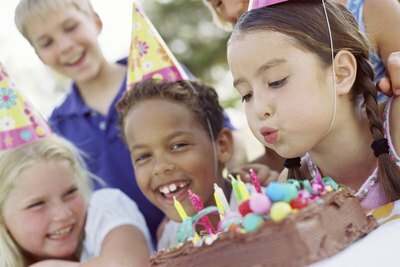 Have enjoyable party games planned that are not too childish, yet not too grown-up. These games also help party-goers get to know one another. Divide the girls into even groups and give each team two rolls of aluminum foil. Tell the girls the object of their team in this game is to create the best outfit out of foil. The girls can use rubber bands or string to keep the outfits from falling apart. Give the girls 15 minutes to create their best foil outfit. The girls can make pants, shirts, hats, sunglasses and jewelry with the foil. Have the adults judge the outfits and determine the best one. If you have just a few girls, team them into pairs instead of groups. Purchase 15 candy bars or candies (more or less, depending on how many you want to hand out). Write down a funny saying that goes with each candy bar you buy. Examples: funny giggles--“Snickers”; 2 minus 2--“Zero”; wise girls--“Smarties”; and get a goal--“Skor.” Use candy and candy bar brands 10-year-olds are familiar with. When you say "Funny Giggles," the first girl to say “Snickers” wins the candy bar. Let the birthday girl be the "cherry tree" for the first round. Blindfold the cherry tree and have her stand in the middle of the room or back yard (better to play where there is room to run) with her arms straight out. Each player is a “cherry” and should be touching one of the cherry tree's fingers. If there are more than 10 players, have each girl touch the cherry tree by placing her hand on her shoulders or arms. The birthday girl asks, “Are the cherries ready?” The cherries respond, “Yes,” and run as fast as possible away from the cherry tree. 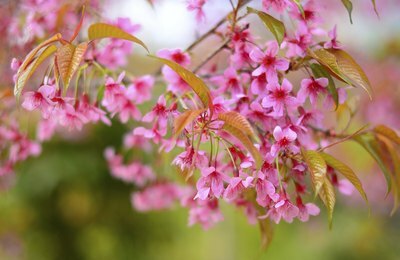 Then the cherry tree counts to 10 as fast as possible and yells, “Cherries drop.” All cherries have to freeze in place and the cherry tree begins to walk around and find the cherries while blindfolded. The last cherry found wins the game and is the next cherry tree.